natural frequency is found increased. machine is laid to rest on the top portion of slab. their tops. The machine is laid and supported within the frame. 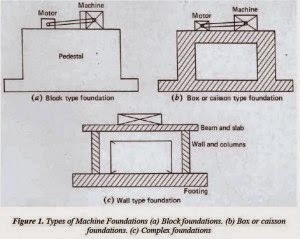 principally offered or constructed with the block type machine foundations. machines functioning or running at higher speeds and also for rotating types. simply directly bolted or fastened on the floor. What is degree of freedom of a block foundation?